Kat's 9 Lives: Did I See Fleur de Sel? Since I haven't posted my recent trip to Boule in LA, I have re-discovered my love for salted caramel! Even as we speak, I still have some left over from my recent return to Boule sitting on the night stand waiting for me to devour them. O=) While we were standing in line for Hog Island Oyster Co. I ran off to look around in the Ferry Building because my back was in pain and standing hurt too much. So why not take the chance to move around and find something that might ease my pain... yummy food! 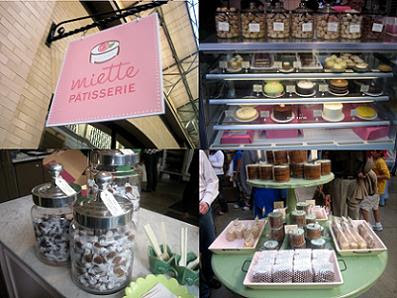 lol I came across Miette Patisserie and the shop looked pretty cute so I had to go in to check it out. There really wasn't much variety or individually packed items to pick up and go. The pastries and cakes in the case did not look that appealing. There was a line so I didn't think it was worth waiting for. I saw that their macarons were stacked in a jar above the case. First off... they should not be so carelessly displayed because if they crack then they are worthless. I ran back and forth to the line to ask Ms. Lin if she wanted anything. She warned me that the macarons weren't that great so I opted to forgo them.